In episode 2 of MBC drama, When A Man Loves (남자가 사랑할 때), Chae Jeong Ah (채정안) was seen wearing a green lace trench coat from Burberry Prorsum Spring/Summer 2013 collection. Later in the same episode, she wore a rose-print peplum blouse and a lace skirt from Dolce & Gabbana Spring/Summer 2013 collection. 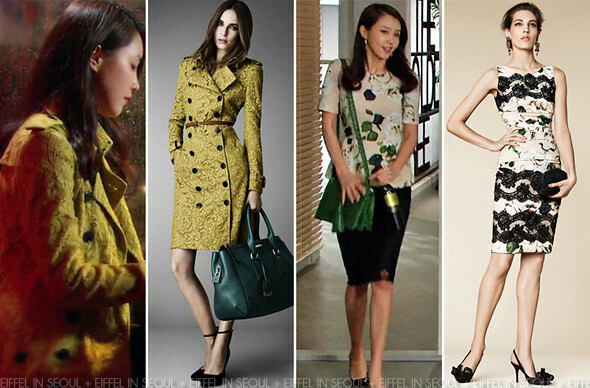 A green leather bag and a pair of black sling-backs to accessorize her look. I love the lace trench coat she wore. Unfortunately, it didn't get much air-time. Which is your favorite look so far?